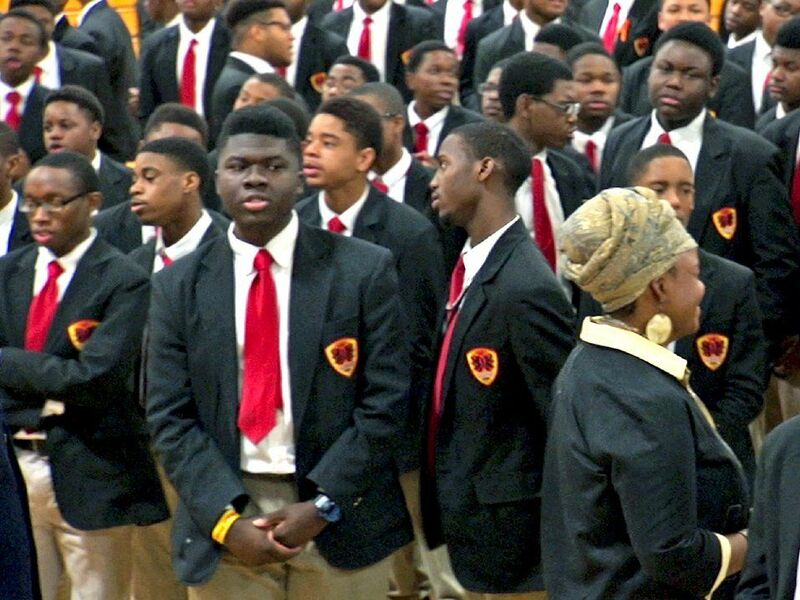 With a culture emphasizing respect, responsibility, ritual, and relationships, Chicago's Urban Prep Charter Academy provides young men with a supportive community for learning academic and life skills. In recent years, Chicago has become emblematic of a national crisis concerning the fates and futures of Black boys, and nowhere are the depths of the crisis more frighteningly clear than within our big cities' public schools. The grim statistics are well known but bear repeating: In Chicago, close to 60% of young Black men do not graduate from high school; only 6% of Black males in the ninth grade will earn a bachelor's degree by age 25; and nearly half of Black males between the ages of 20 and 24 are both unemployed and out of school. Ten years ago, Urban Prep opened the nation's first all-male charter public high school knowing that, if we were to achieve uncommon results, we would have to pioneer an uncommon approach. It was clear, after all, that traditional strategies were failing miserably. Our challenge was intensified by the fact that our school was to serve Chicago's Englewood community, a neighborhood plagued by gang activity and violence, and home to some of the nation's worst-performing schools. In the years since, we've opened two additional schools, launched additional programs to support students' success beyond high school, and achieved a 100% college acceptance rate for our graduates. Students today -- particularly economically disadvantaged Black males -- have more practical problems in their lives than how to solve for x. How can we expect a child to make sense of algebra when he, as was the case with one of our students, is trying to make sense of a world in which his mother is murdered by his father? Contrasted with the neighborhoods in which many of these students live, and with the all-too-common, one-dimensional, negative portraits of Black manhood presented by the media, we recognized a remarkable opportunity to be the place where students come to explore and develop well-rounded, positive conceptions of themselves. At Urban Prep, we provide our young men with swords and shields. The sword is a high-quality education based on a rigorous and culturally relevant curriculum that enables students to fight intellectual battles with the best of them. The shield is the self-confidence, self-possession, and self-awareness necessary for protection in an often unfriendly and unforgiving world. Our students develop these shields, thanks to a school culture grounded in four elements that Urban Prep calls the "4 Rs": respect, responsibility, ritual, and relationships. Students wear a uniform shirt, tie, and blazer each school day, and we use surnames when referring to our young men. In our buildings, students are Mr. Smith, Mr. Jones, or Mr. Davis, not Paul, Rob, or Chris. This simple practice demonstrates a level of respect that Black boys rarely encounter in school, and goes a long way toward inspiring them to think more highly of their teachers, their classmates, and themselves. We create an environment that promotes responsibility by utilizing a student code of conduct that is rooted in restorative justice and emphasizes student growth above all else. We set high expectations for student behavior, communicate these expectations clearly, provide students with the means to understand and internalize them, and hold students accountable for meeting them. If we expect our students to behave, learn, and live differently, then we have to make sure that they feel part of something different. We start every day with a ritual that we call Community. At this all-school assembly, we come together as a family to recognize students who have achieved, encourage those who have faltered, and help them all to focus on the tasks that lie ahead in the coming school day. Like all Urban Prep rituals, Community reinforces the sense that the lives of our faculty, staff, and students are interconnected, and that we are collectively responsible for the fate of each individual among us. Without developing strong, positive, trusting relationships between students and adults, effective and life-altering education is not possible. Urban Prep’s Pride Program places every student in a small group where he remains from freshman year through graduation. Each Pride is led by an adult who has the responsibility of forming deep connections with his or her Pride members and providing intensive mentoring and positive role modeling. The Pride leader is the student's primary advocate within the school, and also serves as the primary liaison with families, ensuring that the school understands the dynamics of each young man's home life. These relationships are not only essential to the Urban Prep school culture, but also to our students' overall development. If the 4 Rs allow us to build a culture that provides students with the swords and shields to battle a world of non-believers, then the Urban Prep Creed is the compass to guide them on their journey. The Creed is inspired by our motto of "We Believe," and is recited every morning at the end of Community. The Urban Prep Creed is a clear articulation of the values that help inform the decisions our students make each and every day at school and in life. You try saying, "We are college bound" every day for four years and see if that doesn't change your world view. This is what happens when we create a school with instructional rigor and a positive culture. This is what happens when we fight for our children. This is what happens when We Believe. For more information on building a school environment where Black males thrive, read Building on Resilience: Models and Frameworks of Black Male Success Across the P-20 Pipeline, forward by Tim King. This blog post is part of our Schools That Work series, which features key practices from Urban Prep Charter Academy for Young Men.